I am sure that a lot of us have been thinking that Nintendo’s line-up of games for 2018 has been somewhat non-existent prior to the Nintendo Direct Mini which gave us an insight into what games we can expect to play on the Nintendo Switch for Spring 2018. Now with the Direct behind us we have a better idea of what games to expect, at least up until June. So after scouring through Amazon.com for the better part of an hour, I have put together a “Timeline” of sorts with most of the physical games that have been confirmed for release up until June 2018. This includes both First and Third party games with some Indies as well and a couple of releases on physical carts of games that have previously been released on digital. You can check out our Timeline in the image below. It must be said that that February and March look pretty full. With a lot more games releasing on the eShop, we are certainly spoilt for choice. April seems to be a quiet period with more focus on Nintendo’s newest peripheral; Nintendo Labo. May will be gracing us with a rerelease of “Classics” and June brings Ys VIII: Lacrimosa of Dana. 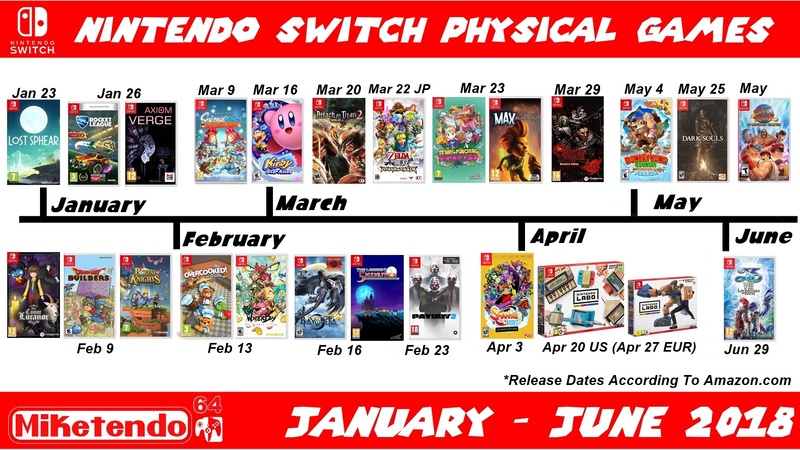 I will just say again, that this “Timeline” is only of physical games that have been confirmed for release. They will no doubt be more release announcements throughout the first half of the year. If you would like to use the timeline image for your own blog, post or other medium, please feel free to do so. We only ask that you credit Miketendo64 for the image as we did put it together, Thank You.